Some years ago, our local oldies station, KRTH, posed a question to its listeners. Call in and list your favorite guitar riffs. All in honor of the passing of another music legend. 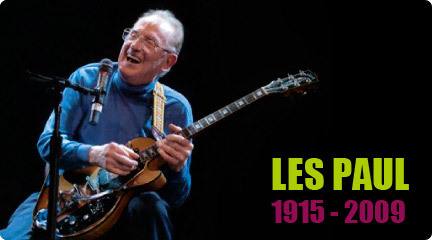 Lester William Polsfuss, also known as Les Paul, passed away on August 12, 2009. Without his creation, the solid-body electric guitar, which made that sound possible, I and others don’t think Rock ‘n Roll happens. Not without his instrument. No way. Years back, I got into the most unexpected argument with my bride of 25 years concerning the inventive rendition Michael J. Fox performed in Back to the Future. I thought it was a nice homage, and a clever use of the time travel paradox. She thought it minimized Chuck Berry‘s legitimate originality and extraordinary contribution to music. As my wife pointed out, “You know I’m right.” See, you can’t win in such music wrangles, no matter how hard you try. This one by Eric Clapton will make a bunch of lists by fans. Who in their right mind would argue against its inclusion. I taught both of my kids the basics of performing air guitar, by age one, with Don’t Fear The Reaper by Blue Öyster Cult. Usually, I’d put this on around their bedtime, before tucking each to sleep. However, when I thought about this in-depth — meaning making a study of my iPod’s library — I couldn’t help but notice a certain group and lead guitarist’s impact upon it. The Beatles in general, and George Harrison, specifically. This one Beatle, thoroughly undervalued in his contributions to the group (specifically) and music (as a whole), was also underrated as wielder of la guitarra. Don’t sell Lennon short as a guitarist, either. Look at Day Tripper, Getting Better, and Revolution, if you don’t believe me. If I run into someone unaware of The Lads, this is the song I share as initiation. John Lennon’s intro, which followed the distinctive feedback note he wanted to spotlight, was repeated with the bright sounds plucked by George’s Gretsch electric guitar. I love this song, notably for the riff that gets it immediately going. Of course the one I cited some posts back, Roll Over Beethoven, would to make it, too. I’d also recommend Guitar World’s Reader Results Poll: George Harrison’s Ten Best Beatles Songs. Can’t argue against any of them, especially their #1, While My Guitar Gently Weeps. “Heck, name the whole album, why don’t you!”, I can hear my better half say. Okay, what she said. But if I had to give him a stage for a riff that I absolutely love, which stands up for his skill as an artist of the guitar, this would be it. George Harrison’s lone guitar solo as a member of The Beatles with The End. Okay, you know where I stand on Les Paul, Chuck Berry, and George Harrison. How about you when it comes to guitar riffs? You wouldn’t think there would be more Beatles’ songs to name, but the riff in Back in the USSR definitely owes its existence to Chuck Berry. And then there’s Helter Skelter. Wow. Ah, yes. Good ones to highlight, Naomi. Thank you! I’ve always liked the opening riff to ‘I’ve Just Seen A Face’, by the Beatles. Also Paul Simon’s brief basic riff that starts ‘I Am A Rock’, by Paul Simon. Plus all of ‘For Emily Wherever I May Find Her’. Superb twelve string picking! Frank Zappa rates high with ‘Apostrophe’, ‘Cozmik Debris’, ‘Dyna Moe Humm’ and ‘Dirty Love’. Plus any pedal steel crancked out by The New Riders of the Purple Sage, The Grateful Dead and Commander Cody. The first time I heard ‘Sultans of Swing’ by Dire Straits. I though it was Dylan showing the world he’s not lost his licks or lyrics! For its great background, and later up front pedal steel work around a Ricky Nelson classic. I feel fine because of George. Thanks. Thanks for spotlighting George. I “rediscovered” him (mostly thru his solo albums) a few years back. Thoroughly enjoyed the exhibit at the Grammy Museum here in L.A. I have to say my favorite is the one from Master of Puppets. The way how James Hetfield plays the rhythm guitar is really astonishing and it’s one of, if not, my favorite songs. Thanks for the comment and for including that clip, ckckred!